Monthly Board of Directors Meeting. Tuesday, April 30, 6:00 PM, North Tower Lounge. Planter-Walls-Street Level: Work is almost completed and the wall surfaces are being painted. When all work has been completed new landscaping will be placed. Dryer Duct Service: Last-Call, Monday 15. Work is scheduled to begin on April 22, and continue through May 3. If you have not signed-up, please do so with a check for $72 made payable to Horizons Owners Association. Waterproofing Planter Walls-Vehicle Ramp: Work continues with workers removing vegetation and soil which is being stored within the partial closure of the circle drive. Granitex Removal-Vehicle Ramp: Work is scheduled to begin on Monday 22, with the placement of scaffolding on the in-bound lane of the ramp which will restrict traffic to one lane. Traffic control will be in place but please exercise caution and comply with posted signs and directions. 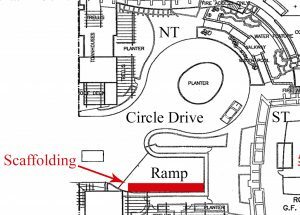 During this project, traffic on the ramp will be restricted to one lane, so please use caution when entering and exiting the parking garage. Work is only permitted Mon-Fri, 8:00 AM-5:00 PM. If you are planning to remodel your unit, please review the Association’s requirements at horizonshoa.com; Documents, General Forms, Home Modification Application. Up Coming Event: Martini Night. April 17, 6:00 pm, South Tower Lobby. Dress to impress, like a member of the rat pack! Package Room Relocation-North Tower. Effective Thursday 15. All incoming packages for North Tower residents will be stored at the new location, and all outgoing packages will be stored at the South Tower. When retrieving a package after normal business hours, please use the phone located on the front desk to call for a Security Officer. Schedule and Staffing Changes. William Smith will be assuming the duties of Lead Officer, 3:00 pm -11:30 pm, Wed – Sun; Rick Bradford will be assuming duties overnight, 11:00 pm-7:30 pm, Tue – Sat; and Ladon Soloman will be assuming duties from 7:00 am-3:30 pm, effective 4-12-2019.
no later than fifteen (15) days prior to the meeting date.